CrossFit is one of the most popular and trying exercise regimens out there and for good reason. It is designed to give even the fittest athletes around the world a staunch challenge. Anyone can just pick up and run with it even if they haven’t indulged in fitness before. This is not to say that it isn’t strenuous – CrossFit games are where the top fitness athletes compete to find out who is the fittest person on the planet. But there are easy starter routines that newbies will find less dauting. CrossFit is an adaptive exercise routine – it can grow with you and as you get used to the schedule, it throws a new challenge at you. While people who are not used to fitness can start doing the best they can, CrossFit builds up strength quickly and they will find themselves wanting more of a challenge. Like most people say, the best CrossFit box is the one you have at home. There are a lot of people, me included, who think that CrossFit at home is going to revolutionize home fitness. If you are looking for a regimen that you can pick up as a beginner or a routine that helps with your plateauing fitness levels, CrossFit can be that weapon for you. Why do you need a Crossfit Garage Gym? 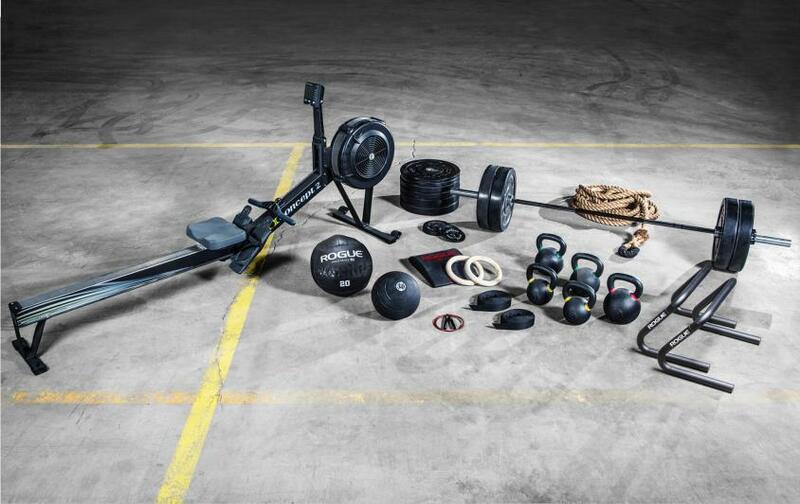 If you are looking to get the most common equipment used by CrossFitters in one place and at a good price without any lapses in quality then Rogue’s SoCal Complete CrossFitter Package should be the one you should be looking at. It combines a good quality barbell (Echo 2.0), medicine balls, 160 lbs of bumper plates, kettlebells and gymnastic wood rings. They’ve even thoughtfully included a couple of spring collars. As far as customization goes, you can opt for their women’s Bella Bar or their top Rogue Ohio Bar. 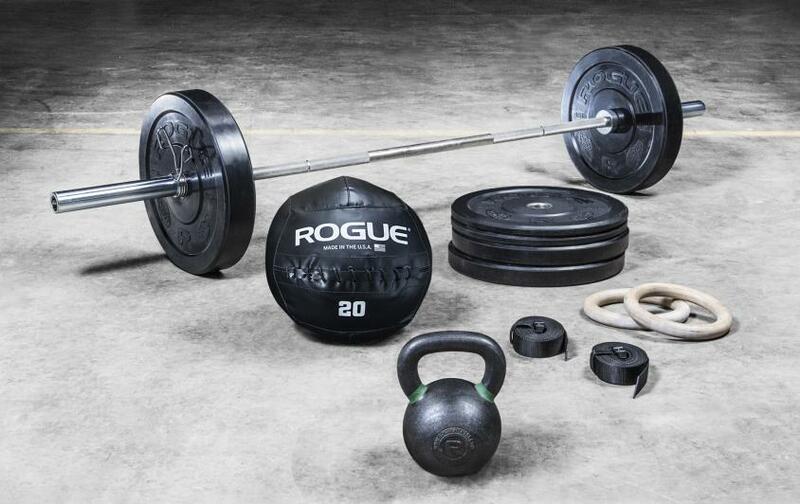 For the more serious home gym enthusiast, Rogue’s Warrior CrossFit Package will do the trick. It has enough equipment to make this a fantastic first choice for your garage gym or own CrossFit box. It has one of the most comprehensive equipment lists offered currently. Let’s take a look at what it actually has – Concept 2 Rower Model D, Barbell (Rogue Ohio Bar) with 320 lbs of bumper plates, kettlebells, medicine ball, slam ball, parallette, climbing rope, and gymnastic wood rings. These should be enough for even advanced CrossFitters who are looking to get their workout going at home. There are a lot of people out there still who are not convinced about the advantages of a home Crossfit gym, much less a garage gym. Well, the advantages over a commercial gym are numerous and too difficult to ignore. A gym membership in most places cost a bomb. And what do you get for the price? Not much if you are actually looking to lift some weights rather than just post pics on Instagram. 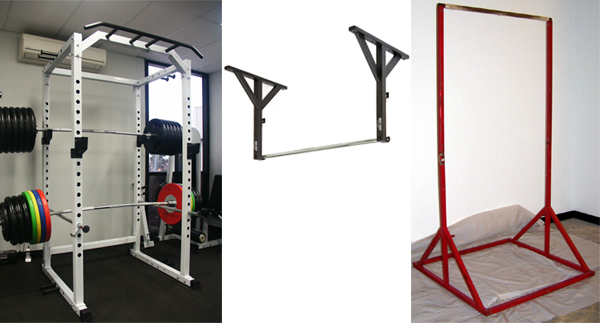 Check out our Guide about Power racks to know more. You will have long queues at the machine that you are looking to work with and all you will do is ending up hurrying through your set and end up with a lackluster burn with your workout. A home gym is literally open 24/7 and right in your house! Believe me, this is as convenient as it gets. Compare this to that gym more than a few blocks away to which you have to spend time traveling back and forth, while making sure that you have enough time to get ready for work. Huge hassle. All these problems are addressed when it comes to home gyms. I actually happened to visit a gym that said no “sleeveless t-shirts” or “grunting loudly”. When it comes to your home gym, you can wear what you want and be yourself when you are deadlifting that weight. No one is going to bother you and this is a huge plus point for people like me, who prefer their own space to workout in. The top three items I would consider for my home garage gym CrossFit regime is what I’m going to tell you here. If you need to accomplish your goals and dedicated CrossFit fitness plan, you definitely need Olympic weightlifting bar, bumper plates, and a pull-up bar. After these have been procured, then the rest can added based on your preferences. While I’ve termed the rest of them as secondary, they can help you level up your Crossfit game and get you even better results. These can be a bit less expensive and you can pick them as and when you feel like you need them. I bought them early. So, let’s check out what you need at home to start your own complete CrossFit regimen. When you are looking to develop strength and power, there isn’t nothing that comes close to the versatility of the power rack/squat rack. A lot of CrossFit motions are compound which means that just having a pair of dumbbells are not going to cut it. A power rack can let you execute a number of movements including the big three, presses, squats, and deadlifts. When it comes to CrossFit, you’ll also get the added advantage of being able to do kipping pullups, chin-ups, muscle ups, and a lot more. This is one of the most essential pieces of equipment to build the perfect fitness plan around. The number of exercises that you can get done with this single equipment is mind-boggling. There is nothing like a power rack to heavy squats, presses and other exercises that require the support. You increase your safety considerably which means you can focus on your exercise and not worry about anything else. When choosing a squat rack, you need to keep in mind that they take considerable load and you need to make sure that you get the best you can. A good power rack is literally the only thing that is keeping you safe from hundreds of pounds of crushing weight. Take into consideration the height of the power rack versus your ceiling especially when you’re going to use it for kipping pullups. Also make a note of the placement of the power rack when it comes to the width – a barbell is about 7’2 foot in length. This is a considerable amount of space you’re going to need, so make sure that you have enough room to maneuver. A power rack comes with a lot of accessories and you need to make sure that you’re getting the right ones for you. Are you partial to heavy squats? Get squat handles. Dips your go to exercise movement for chest and triceps? You can get a dip handle for your squat rack. I’d go so far as to say accessories can make or break your squat rack experience – they’re that important. If the brand you’re looking at doesn’t have the accessories that you want, either switch brands or find accessories that are compatible. Additionally, you can also use it to pull-up and chin-up at your convenience. There is nothing like training your back when it comes to exercises like pull-ups and chin-ups. CrossFit involves a lot of those exercises and getting those cheap door handle pull-up bars well never do. Since they aren’t very expensive anyway, I don’t bother with cheap alternatives or DIY bars. Finally, you need to check if your power rack is durable. The best squat racks come with at least 2 X 3 11-gauge steel. This gives it ample strength to deal with the heaviest weights you throw at it. The feet of your power rack need to be bolted down for extra stability. Where would fitness be if it weren’t for these trusty servants of muscle building. They’ve evolved for over hundreds of years and they’ve reached their pinnacle of their function recently. Barbells are indispensable for just about any other fitness or strength building activity around. CrossFit also use barbells in a lot of their exercises. A barbell is going to serve you for a really long time. So, don’t cheap out on this even if you are going to for the rest. When you try to pinch pennies here, just remember that you aren’t saving money, you’re throwing it away. And this is definitely going to happen when you buy a cheap bar. I’m sure you’re wondering which type of barbell you’re going to buy. CrossFit regimes have a variety of movement, so you need to choose the right bar. Basically, there are 2 types of bars that you need to choose between – powerlifting bars and Olympic bars. The critical differences between the 2 are that powerlifting bars have aggressive knurling while having less whip (bend). For CrossFit, Olympic bars are the right choice. They have adequate knurling which won’t tear into your hands when you need to transition between movements. This coupled with the fact that the collars of an Olympic bar spin, makes it a much more ideal proposition for lifters in the CrossFit arena. Standard Olympic barbells weigh 20kg and women’s barbells are 15kg. Another difference between the two is that the women’s version is made for smaller hands, the bar’s diameter is 25mm compared to 29mm of the men’s bar. When you’re looking out for a barbell, the first thing you need to do is check their maximum load. The best barbells have an upper limit of about 1,000 pounds which means you’ll never breach their upper limits. It makes sense because the stronger the bar the more resistant it would be to bending or warping. Another factor is the tensile strength of the bar – you need a bar that it at least rated 180,000 PSI. It isn’t? Don’t bother with it then. It’s that simple. Hex bolts are a strict no, no as they take too long to get on and off. Most good brands like Rogue, Eleiko and Ivanko have bars that are rated more than 200,000 PSI. The last thing you need to make up your mind on would be the finish of the barbell you’re going to buy. While unfinished steel bars have a lot of grip, they’re prone to rusting. The top bars in the market come with a coating of chrome, which is a lot expensive than other types of finishes. Chrome finished come in satin or polished. For more advice with barbells, you can find them on this site as well. Buying guides, exercises and various other resources are available and they can help you pick the right equipment/exercise for your target fitness goals. 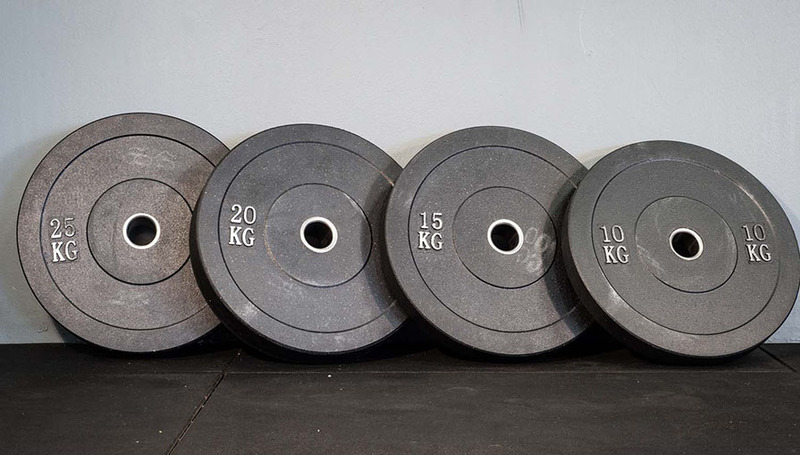 When you buy a barbell, you’re going to need some plates to go along for complete lifting goodness! There are metal plates and then there are bumper plates, plates with a rubber coating. Unless you’re really strapped for cash you should opt for the bumper plates. Why? Because even though they might be a bit more expensive, they last longer, your floors last longer and they don’t corrode easily. For anyone who isn’t aspiring to be a powerlifter, I would recommend bumper plates any day. In the long run, these are a lot more forgiving on floor, and walls. Also, that extra layer of rubber means that rust is not a problem you need to be concerned with. Another variation that you need to be concerned about is the standard plate versus an Olympic plate. The Olympic variation is a more consistent size across all of the fitness industry. These plates have a 2” inch hole and they fit Olympic bars and other commercial bars around. Brands like Rogue, Vulcan, OFW, and HI-Temp are most preferred by home garage gym enthusiasts. Statistics show that the most preferred brand for home users in terms of quality, performance, and price is OFW. There are high grade competition-oriented brands, Eleiko and Ivanko, which focus on extreme quality but are overkill when you consider home gym purposes. Some plates have a handle around them which helps lugging them around a lot easier. a lot of experienced lifters feel that Olympic plates are a lot more stable on the bar. Plus, when you consider the fact that Olympic bars can hold more weight and are sturdier, you would do well to consider Olympic weight plates to go along with it. There are several variations to plates, technique, training, competition, and fractional to name a few. If you can’t afford competition levels plates, no big deal. You can stick with training bumper weight plates from a popular manufacturer like Rogue, Eleiko or Zhangkong. These are just as good as the competition plates and are great for use at home anyway. Glute Ham Developers are small and offer great benefits that you can use for developing glutes, hamstrings, core and lower back. Many commercial gyms don’t have these and hence people are unaware how to use them or how good they are. I think there has to be a good portion allocated to this wonderful piece of equipment in every gym. Glute Ham Developers are something that not people have in their home gyms and if you have any excuse other than not having enough space – you have no excuse. Before you buy a GHD, you need to make sure that it is a stable base of fitness operations as you have your whole body on the machine not to mention the weight exerted at awkward angles. It also needs to be adjustable for different heights and there is always the danger of a not so great brand of GHD tipping over. A lot of GHDs are built so that they do not buck under heavy loads at most angles. Most top of the line GHDs are heavy and this is to minimize movement of the machine when the user exerts force on it. You also need to pay attention to the footprint of the GHD. While it is true that the more footprint a machine has, the safer it is, you need to factor in the limitations of your home gym as well. If you want a high quality GHD, Rogue is a pretty good retailer you should consider for your needs. They sell Legend Fitness brand of GHD’s, the Sorinex M2 and their own Rogue Abrams GHD. Both of them are good and they can get the job done. They also come with the option for adding band pegs for additional resistance. We are back to the heavy stuff! Kettlebells are equipment first brought into the world by the Russians. Kettlebells started as weights merchants used to weigh goods. Soon people began to use it to test their strength and now we have kettlebells as a mainstream lifting equipment. Kettlebells form an unlikely but a large portion of the CrossFit regime. You are going to need at least a few of them for your gym so you can work out effectively. 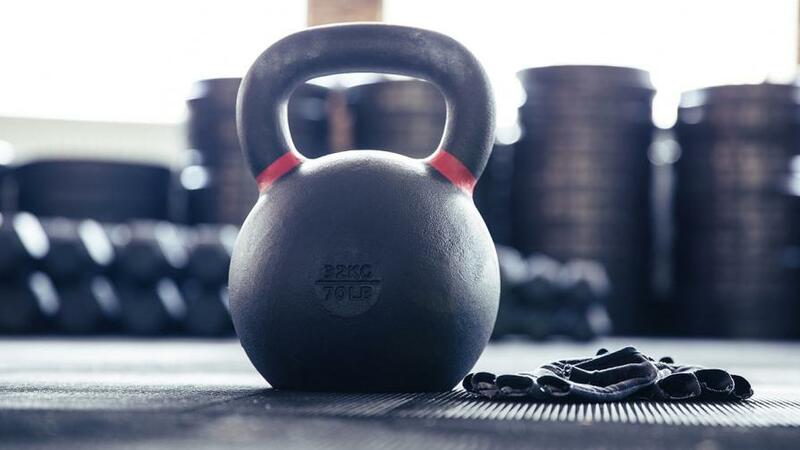 While a full set of kettlebells can be hard to justify, learn to select what weights you would ideally require at first before you venture further. You can add more as your requirement increases. There are several advantages a kettlebell has over a dumbbell. Since the weight is off-center, you can use a kettlebell for a lot more exercise routines than a dumbbell. And since kettlebells have been around for a really long time, there are a lot more exercises that you can get done with them. Another thing is that you can do full-body exercises with kettlebells – something that you just can’t do with dumbbells. When you want to buy a kettlebell, you need to first decide on the obvious thing – weight. Don’t go gung-ho and choose weights that are going to be too difficult for you to execute movements with. A rule of thumb for a guy with an average build would be to try 8 kgs and up. Even if this is a bit heavy, kettlebells put on muscle quickly, so you will quickly grow out of them. A couple of things that you need to look for before you settle on the purchase of kettlebells – you need to make sure that they aren’t coated with epoxy (chipping and flaking problems). Make sure that they do not have a ‘seam’ on the bottom of the handle as they tend to play havoc with your hands with the heavier weights. Cheaper kettlebells are notable for their welding or molding seams on the handle. Take hold of the kettlebell in question so that you get a feel for it and also to check out how much space you actually need the handle. A very important aspect of a kettlebell is the handle. You need to get a kettlebell with a good quality handle because if your kettlebell handles are rough or has edges, you could end up doing damage to your hand. Cheaper kettlebells have a problem with rough seams and these are not at all comfortable. Better brands like Rogue, Onnit or Vulcan should be your go-to choice. High-quality kettlebells like those from Rogue have no seam as well as have a nice powder finish. Eleiko also makes good quality kettlebells that come in various colors that can liven up your home garage space. But they are a bit too pricey for what they offer, so I would skip them. Vulcan Strength offers great looking competition grade kettlebells that are pretty durable. A critical piece of equipment in your gym is going to be the weight bench. There are myriad exercises that you can carry out with these and I would recommend that you pick one up whenever possible. You can combine this with a power rack to get heavy bench presses done, core workouts or dumbbell flys, arm workouts, and much more. The strange thing about weight benches is the fact that being so important, there is not much information on how to choose the right one. 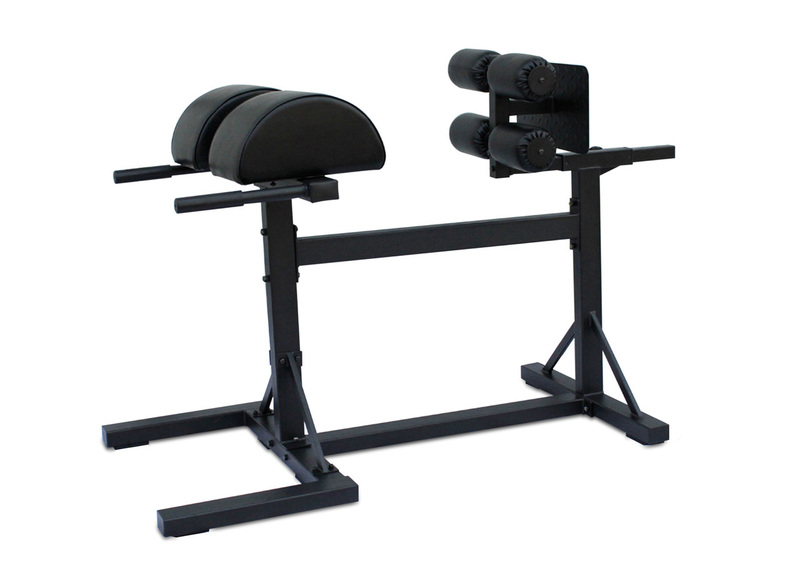 Getting a weight bench enables you focus on all major muscle groups, chest, shoulders, back, arms, quads, and calves. This means that most of your fitness needs are enabled with just a single piece of equipment, so this definitely gets on the Need To Have list. There are a few things you need to look at when you are considering a weight bench for your home CrossFit gym. A key factor is adjustability – you need a weight bench that you can adjust for upright, decline and incline positions as well. The more variations you get on your weight bench, the more exercises you can get done. When it comes to benches, you can afford to be a bit stingy with the purchase. Just remember to look out for the basic requirements for one: solid construction for the frame and high-quality foam for cushioning. York and Rogue manufacture pretty decent looking benches that relatively inexpensive. Even Adidas makes good quality benches. You need a bench that has a decently wide base, so it is not prone to wobbling. Also, as sturdy as the weight bench needs to be, it should be too heavy. This is so you can move it around without much effort. Weighted ball exercises are increasingly becoming popular and it’s all because of CrossFit. These are extremely proficient at giving you a strong core and built abs. Medicine balls are used by people to supplement different types of exercises like pushups or crunches. It is built solid and ideally the weight is spread even throughout the ball for better handling. 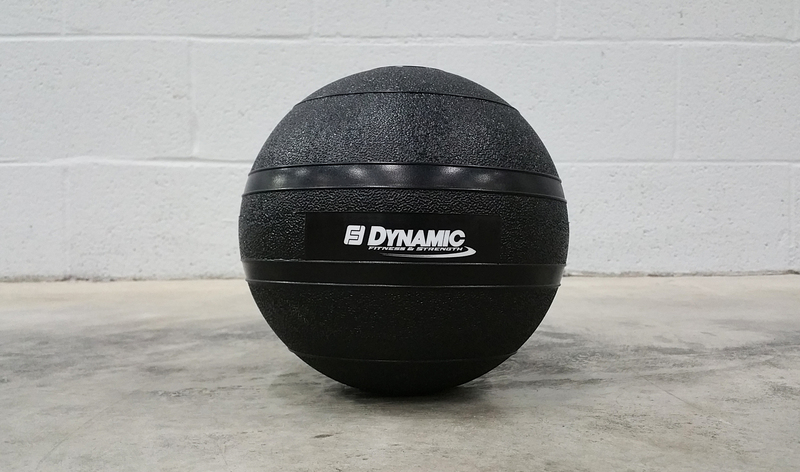 Wall balls and slam balls are designed to be thrown against hard surface in the process working your entire body. A significant difference is that slam balls are made to be thrown against the ground while wall balls are thrown against the wall. Medicine/slam balls have a lot of uses but are mostly used by the majority for wall-balls. They are also added to several other exercises like static plyometric exercise or core workouts. Rogue racks feature an accessory for attaching a wallball to the rack. They are also an option for less bounce which won’t give up on you that easily when it comes to durability, even after repeated slams. 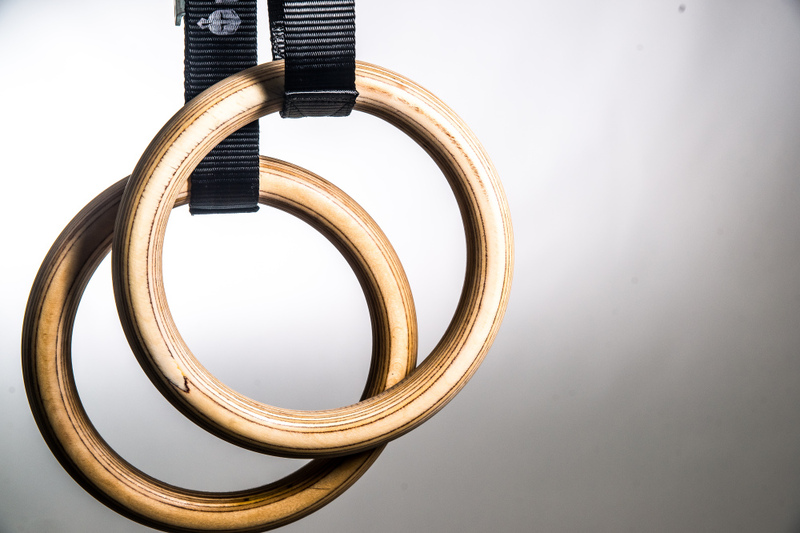 Provided you have space, a pair of gymnastic rings will get you to new heights (pun unintended!) of physique and strength development. They are awesome for building upper body strength through muscle ups, front levels, ring dips, ring rows and plenty of other movements. They are made up of either wood, plastic or metal but it all comes down to preference. They are pretty cheap on the market, no reason to not own a pair of them for your routines. Contrary to popular belief, just training with plates and barbells can only give you limited progress. You need exercises like rings, plyometrics and calisthenics to get you the fully developed physique you’ve always wanted. There are a lot of differences with working with static weights or support when compared to rings. This is especially apparent when you try doing a handstand using the rings as opposed to a parallel bar. You’ll find it needs a lot more effort and concentration to achieve equilibrium on the ring versus the parallel bar. An important thing to consider with the gymnastic rings is that its not just strength that matters here, you also require a lot of coordination to execute certain poses or movements on the ring. This is because a ring is always moving, and it requires effort from you to keep it under control. Gymnastic rings require strength and skill to perfect, but it is definitely worth it. I went with Rogue rings for my use and till now they’ve performed admirably. I highly recommend them for your home garage gym use. Plyometrics are a cornerstone of a goof fitness program because it doesn’t just improve your physique, but it also improves your balance. Plyo boxes are used by athletes to improve their performance at games like football and basketball. Plyo box exercises increases lateral stability and responsiveness making it an indispensable tool for sports. There are several types of plyo boxes available out there, wooden, metal, and foam to name a few. They have functions that can be adjustable, angled etc. Their heights vary from 12” to 24” and people mostly have them around for jumps, step ups, or sometimes even box squats. This is one of those items that you can buy anywhere. They also come in varying heights that can help you do step-ups or jumps. Rogue is the official supplier for the CrossFit games for plyo boxes. The traditional wooden plyo boxes come in single height or a 3-1 configuration. The single sided plyo box can only be used one way – you cannot get varying heights like the 3 in 1 plyo box. You can also find metal plyo boxes which are much more robustly constructed and last you much longer than the average wooden plyo box. You can also find adjustable plyo boxes, which are although expensive, can last you a longer time. If you’re just getting into plyometrics, remember to start small before you go for the taller ones. There are hundreds of DIY projects available for people who like to build their own. But like the pull-up bar, they are pretty inexpensive to buy, and you can save a lot of time by just buying it off the shelf. If you’re looking for the most compact cardio exercise, then you need to take a look at the good ol’ jump rope. They are a fantastic investment to add a bit of difficulty to your cardio routine. It also improves your coordination tremendously and the best part is you can take it wherever you want to as well. You’ll need a good quality rope for your double-unders. I feel that anyone, regardless of their alignment to any specific training regimen, should own a jump rope. It affordable and easy plus you don’t need a ton of space. There are battle ropes which I consider a strictly optional item. There are a lot of people who use battle ropes since they fit into the high-intensity training encouraged by regimens like CrossFit. 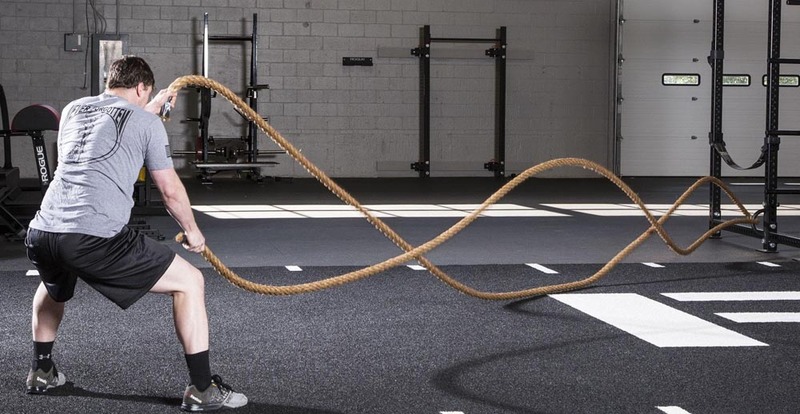 I prefer battle ropes for the heavy upper body workout it can give you. I’ve always felt like this was an upper-body dash which exerts all the muscles equally. To round off your CrossFit routines, you could also add a few cardio machines to your routine. Cardiovascular machines get the blood pumping and in conjunction with strength developing routines are the best method to drop those excess kilos quickly. You can pick whatever you’re comfortable with here – rowing machines, spin bikes, or treadmills. We have the best cardio machines for your home gym rounded up for you, so you don’t have to search anymore. But when it comes to choosing only one, we would definitely recommend a rowing machine for it’s ability to give you the complete full-body burn. We think it is one of the best cardiovascular fitness machines that you can get for your money and is an integral part of the CrossFit experience. Most of the CrossFit gyms feature this as a mainstay and most people including us would include this without hesitation. We’ve covered rowing machines exhaustively on this website and you would do well to check it out. If you’re in a hurry though, you can pick Concept 2 Model D rower which gives you a lot for the money and is durable as well. Another suggestion that is overlooked by a lot of people, Parallettes is a worthwhile replacement for parallel bars and you can find the steel version from Rogue. If you feel that it’s too expensive then you can opt for DIY guides and instructables which use PVC material to good effect. This is one of the most critical pieces of gear that you need. A CrossFit shoe has to be able to take a lot of weight and be flexible enough for box jumps and other activities. This means that you must invest in a decent pair of shoes which can withstand the rigors of everyday CrossFit. When it comes to gear, you need to pick and choose ones that are durable and worth your money. It also needs to amp you up for a long session at the gym and protect you from the elements. And most important of all, it needs to be comfortable, so you can push yourself to your absolute limit and not worry about anything else. Well, considering I was able to keep you absorbed in the article till this, it must not have been all that bad, right? There are several guides out there that have another perspective and you need to do research done before you make up your mind about your home gym equipment. While CrossFit might be a tough workout regimen, just remember not to give up on it our yourself. The key would be to not have too many zero days – where you don’t get anything done. Stick to realistic goals and don’t overreach too early because that can be detrimental to your progress. The gear listed here is part of a lot of CrossFit workouts and you’ll be able to do the most common workouts and WODs. If you found this post useful, please do consider sharing it or letting your friends know via social media. Have something to add? Please feel free to do so in the comments section below. I really appreciate it!